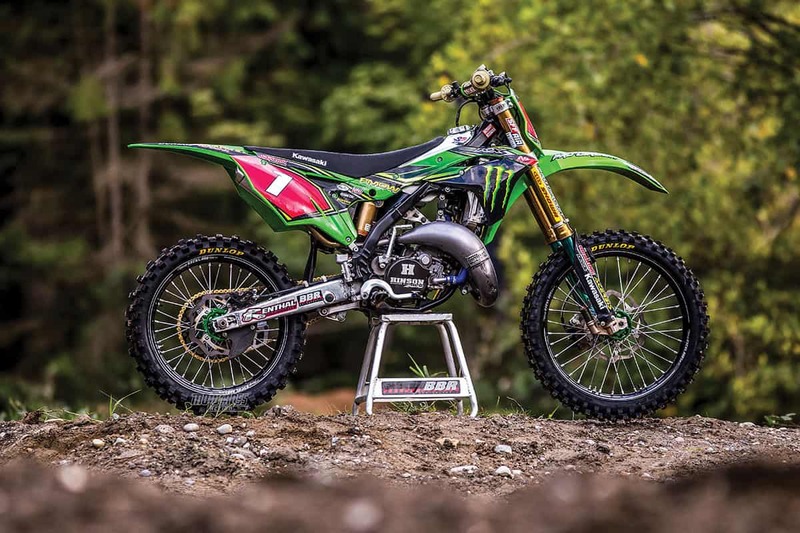 If Kawasaki never stopped making two-strokes, we imagine Carson’s custom-built KX125 would look similar to what a 2018 KX125 would. Two-strokes are a blast, especially 125cc smokers. They might be slow in a world of four-strokes, but that’s what makes them so much fun to ride. Just hold them wide open and you’ll remember why you ride dirt bikes. The burnt-oil smell is incredible too. Up here in the Pacific Northwest (PNW), we have the 125 Dream Race at Washougal MX Park, which is the coolest race on the planet­—BBQs, holeshot races, pit bike races, bike shows, and Beginner to Pro classes. It has been going on for a few years and has really caught on across the country. 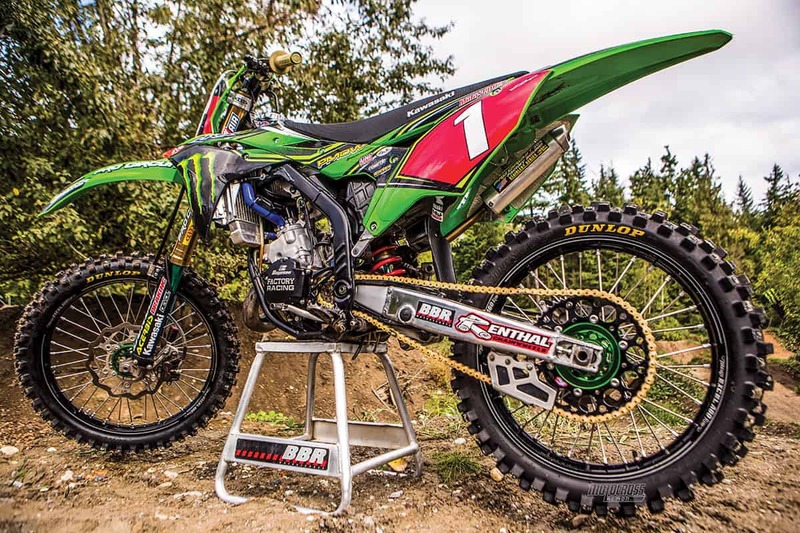 People in the PNW spend an entire year searching Craigslist, planning vacations and building 125s to get ready for the Washougal 125 Dream Race. I’m one of those guys. I have raced most of them over the years and have ridden and built some pretty cool bikes. Rumor has it that there might even be a 125 class added to the AMA outdoor Nationals for 2018. This year I was on Team Green Kawasaki KX250F for some of the Amateur Nationals, so I started looking for a KX125 to race for the 125 Dream Race. 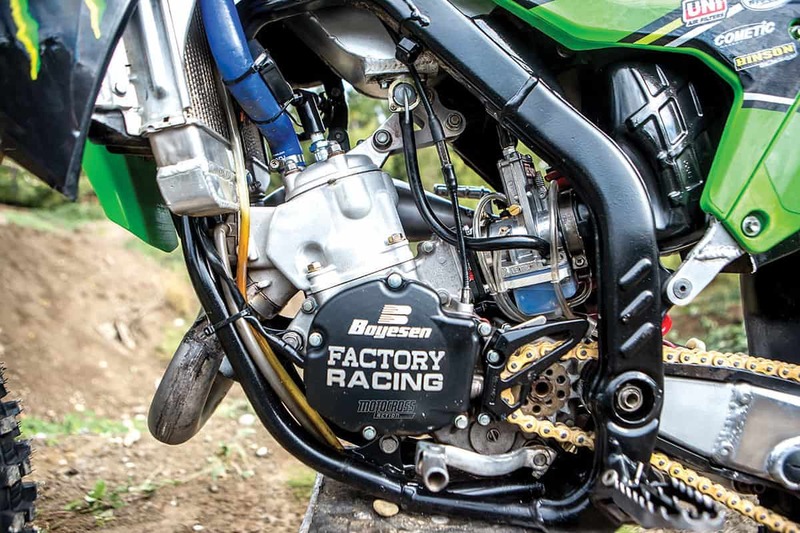 Since Kawasaki hasn’t made a KX125 in the U.S. since 2005, it wasn’t going to be easy. I had a 2005 KX125 when I moved up from Super Minis a few years ago, and I think my Super Mini was faster. A buddy of mine happened to come up with a blown-up KX125 to use as a donor to get the project started. My favorite thing about the KX125 is that it handles incredibly well and feels like a toy on the track. For me, everything is in the right place to go fast, so it’s worth the effort to make a modern version. Carson had the choice to run either an Athena 125 or 144 kit. He chose the 125 due to its higher-revving personality. My family owns BBR Motorsports, so they usually go crazy with bike builds, and this project was no different. Of course, they wanted to put the KX125 into a 2017 KX250F frame, which made sense, until I tried it out. For me, aluminum frames and two-strokes don’t get along. The aluminum frames are too stiff and vibrate no matter how well the crank is balanced. I want my 125 frame flexing like a rubber band. 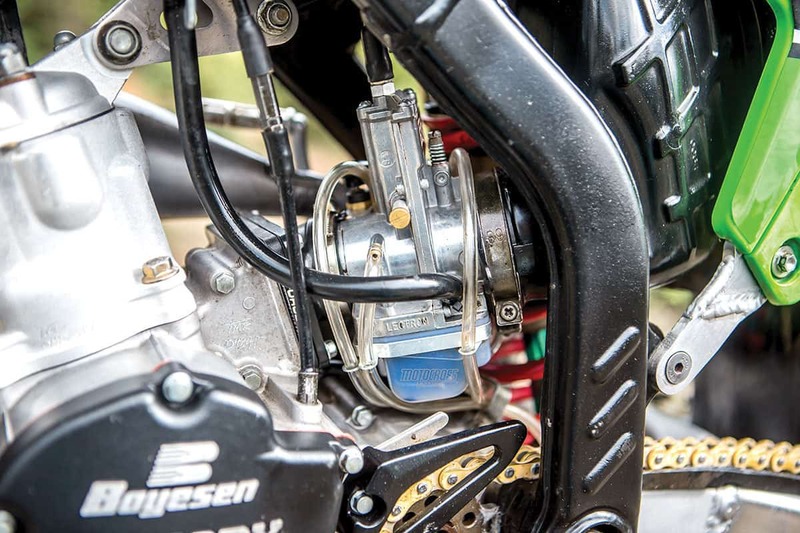 The other issue was that the KX250F swingarm bolt is moved further back to fit the longer and taller four-stroke engine, so that causes even more handling problems. I’m sure when Kawasaki is forced to build another 125 two-stroke, they can make it all work if it’s designed around the 125 engine from the start. We decided to update the stock ’05 steel-framed chassis with the 2017 KX250F bodywork. First, we made some brackets to mount the subframe and used the stock KX250F tank. It worked awesomely, but I was looking for something more. We ended up making a gas tank that moved everything an inch closer to the head tube so I could get a little further up on the bike. A custom subframe was built to get it to all fit like a production bike. Carson first tried the new aluminum frame of the 2018 KX250F with the 125 engine. It was too rigid for the small 125cc powerplant. The old frame handled much better. Once the bodywork was sorted out, we got Bones at Pro Circuit to do some Showa A-Kit suspension for it. We used air forks to save even more weight. 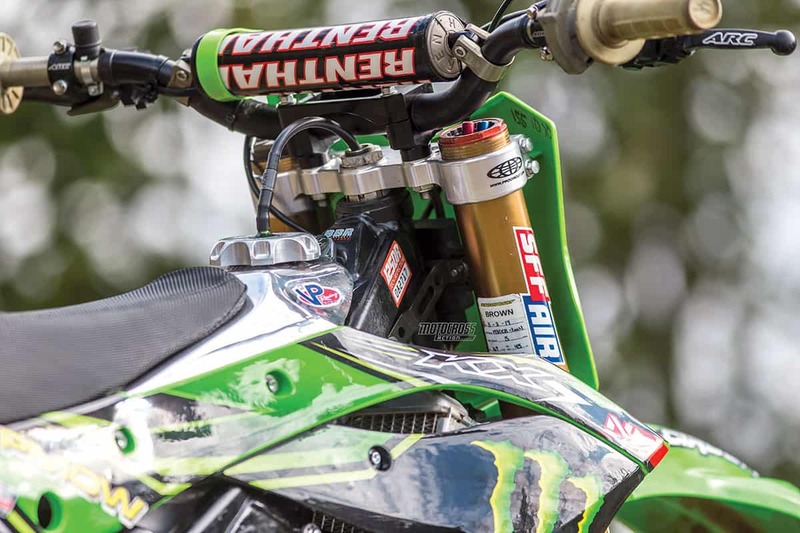 The main thing the A-Kit suspension has over the 2017 KX250F production suspension is that it stays consistent. It always feels the same due to the oversized fork tubes, large shock shaft and coatings. The trick Lectron carb has an external screw to fine-tune the jetting. 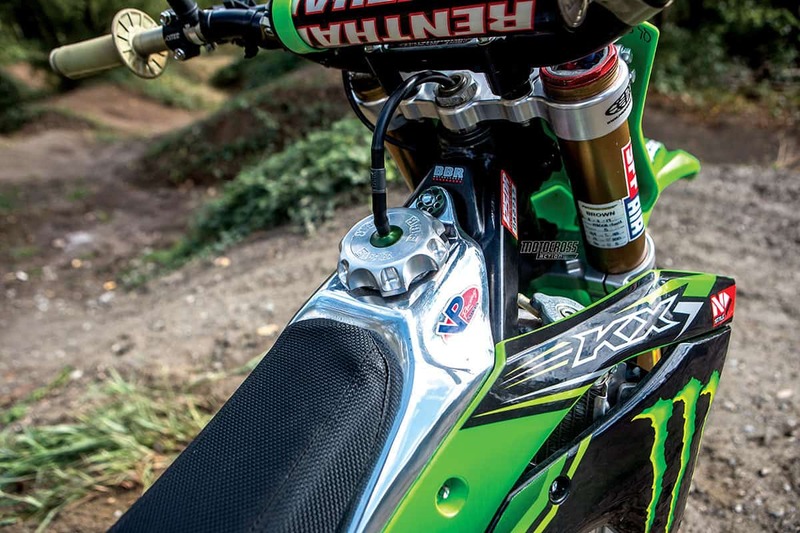 It made it easy to tune the KX125. As far as the engine, we used the Athena 125 kit because it revs super high. Athena also makes a 144 kit that is awesome in the sand, mud, woods, etc., and it has more bottom end. I tend to ring the bikes all the way out, so I prefer the feel of a quick-revving 125 kit. We used a Pro Circuit works pipe with the longer R silencer for even more top end. I’m a reed chipper, so Moto Tassinari sent over one of James Stewart’s V-Force 4 reed blocks, and that really let the KX rev high. The 125 can be tricky to jet perfectly because it runs the best when it is lean; however, there is a fine line between perfection and disaster. We used a Lectron carb, and it came jetted almost perfectly right out of the box, which lowered my mechanic’s stress level. They use an external screw to fine-tune the jetting instead of a main or pilot jet. Genius. Showa A-kit SFF air forks were dialed in by Bones Bacon for Carson’s KX125 chassis. KX125 clutches often get hammered, so a full Hinson setup was used to eliminate any problems. I run Dunlop MX3S tires everywhere these days, mounted on Excel A-60 rims and Pro-Wheel lightweight hubs. In addition, Renthal bars, grips, sprockets and ARC levers are all things that make me feel comfortable. N-Style came through with the factory team graphics to complete the updated look. BBR made a custom gas tank that moved everything an inch closer to the head tube. This allowed Carson to sit further up on the bike. This KX125 isn’t the fastest 125 I have ever ridden, but this bike is without a doubt the best-cornering, best-suspended and best-handling bike I have ever raced. If you are looking to have a great time racing and working on dirt bikes, the 125 Dream Race is one to get on your calendar now. See you there! 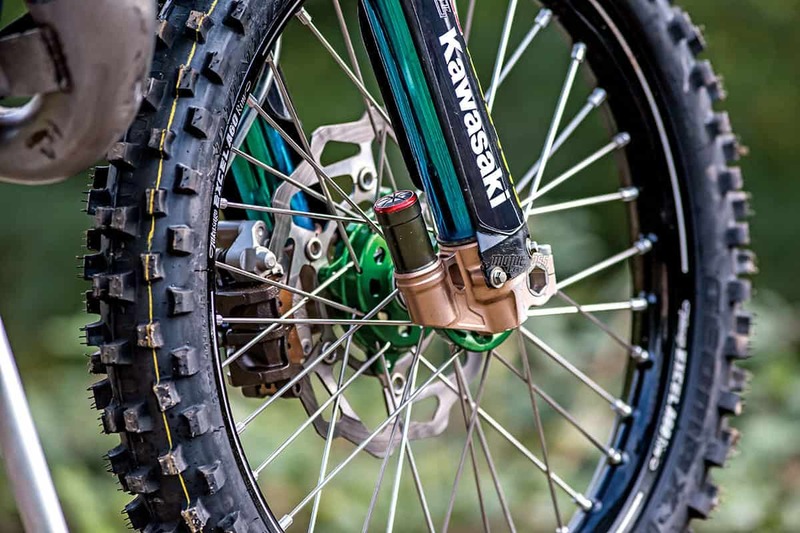 What the A-kit Showa SFF TAC forks have over the KX250F production forks is that they are consistent due to their oversized fork tubes and coatings.